Many educators require student portfolios because they are an ideal way to get students to reflect upon their learning. To create portfolios, however, students must spend a lot of time managing their projects and assessments. But when portfolios go digital, particularly online, the process can be streamlined and made more meaningful to students. By literally clearing away the clutter associated with paper-based portfolios, the initial collecting of files can be more easily accomplished. Even more, using digital portfolios could also be a way to integrate bleeding edge technologies into the classroom. The growing number of online content creation resources can make the organization, reflection, and presentation of student learning easier than ever. By having students collect their work and actively reflect on the process of their learning, students can understand their education in a greater context. photo © 2008 George Laoutaris | more info (via: Wylio)Dr. Helen Barrett, an expert on the subject, argues that there are 2 distinct faces to portfolios: the workspace – which focuses on the process of learning, and the showcase – which focuses on the end product that can be assessed. 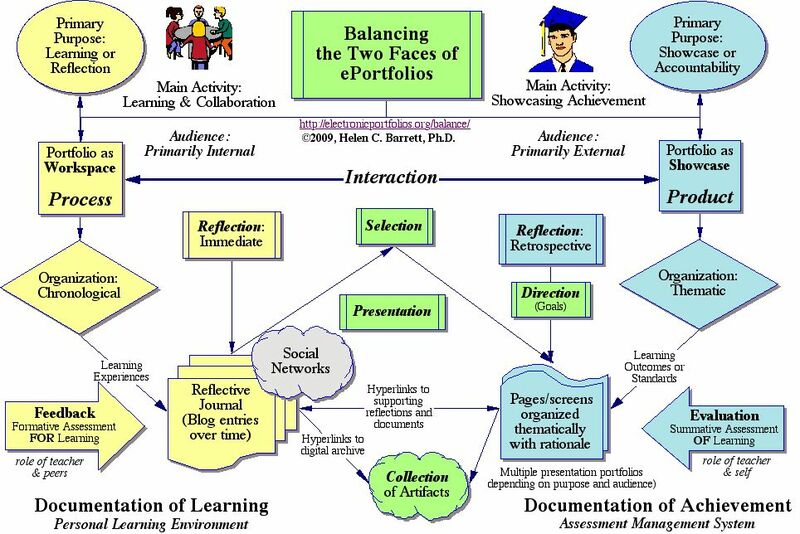 To effectively develop the use of portfolios, these two aspects must be kept clearly in mind, and in Barrett’s words: “balanced.” (Helen Barrett, 2010.) Understanding the school’s essential learning objectives will help educators as they introduce portfolios into the classroom. Reflection/Feedback – Student creates a journal that focuses on the process of learning, and shares it with teachers or other students to gather feedback. Selection/Presentation/Evaluation – Student selects prime examples of learning, and creates a presentation to show how this sample highlights the process of learning from their reflections. Teachers evaluate this process. photo © 2004 San Jose Library | more info (via: Wylio)It will make everything easier! One of the most cumbersome aspects of maintaining a portfolio is the organization of physical copies of your work, particularly if your portfolio is meant to culminate through multiple years. By using digital artifacts online, it can be easier to collect and access your material from any computer with an Internet collection. Even more than this, by using blogs, wikis, or social networks, the process of actively reflecting and gathering feedback becomes an essential part of the learning experience throughout the process. This can help ease the selection phase, when materials are chosen to be included in the showcase portfolio towards the end of the year. One of the great things about the social web is that its easier than ever to reorganize content. Although a digital portfolio requires a collection of resources, these digital assets could be managed on a different website and simply embedded in the digital portfolio page. For example, students can store video presentations on Youtube and simply embed these videos on their portfolio site. To effectively create and prepare digital portfolios, students must begin to work in a digital space. This will be a great shift for many teachers, particularly when introducing elements of the social web into the process. However, if every hand-made student project needs to be scanned and uploaded to a server, the process of collecting artifacts won’t be easier, but much more cumbersome! Teachers and students must begin working in a digital environment in order to make the digital portfolio process effective. Digital portfolios don’t need to be bundled into one specific software, although there are many softwares available (such as the open-source Mahara). Instead, many schools are using free web resources to have students easily create digital portfolios. Google-Sites, Blogger, WordPress, Wikispaces or even Google Docs are some examples. “The Research on Portfolios in Education.” Barrett, Helen C.
This article provides an excellent overview of why to use portfolios in the classroom. “Balancing the Two Faces of e-portfolios.” Barrett, Helen C.
Educação, Formação & Tecnologias, 2010. “Wrapping My Mind around Digital Portfolios.” Tolisano, Silvia. Langwitches Blog, Aug 4, 2010. This blog post provides an essential overview and synthesis of research on various aspects of digital portfolios. A perfect introductory post on the topic. “Process Vs. Product.” Sprankle, Bob. November Learning, Mar 5, 2011. This blog post doesn’t deal with portfolios explicitly, but makes an interesting argument regarding the importance of the learning process is education, not just the final product of a perfect presentation. “Digital Portfolios: Documenting Student Growth.” Cramer, Matthew. Coalition of Essential Schools, 2009. An article by the Coalition of Essential Schools about the use of digital portfolios at the Camino Nuevo High School in Los Angeles. “Authentic Assessment Toolbox: Portfolios.” Mueller, John. North Central College, Naperville, IL., 2011. A great, practical article for teachers on how to begin thinking about, and then practically implement portfolios in the classroom . Would you please credit this post to “Sprankle, Bob”? I apologize; I have updated my post to give you full credit! I would love to implement this at our school. Thanks for the information!